Though I prefer the nail salon over doing my own manicures, sometimes an eye catching nail product inspires me to do a little DIY nail treatment. I love the classic colors and playing card inspired design of these L'Oreal nail stickers. Don't you think they would add the perfect finishing touch to a Valentine's Day mani? 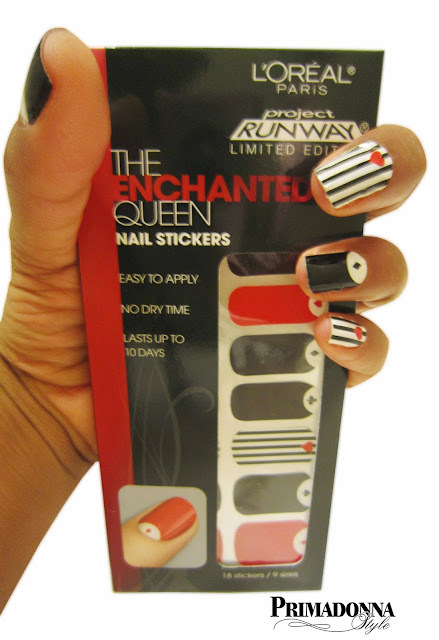 I'm spreading the love by giving away two sets of The Enchanted Queen Nail Sticker Sets to my fabulous readers! Check out all the info on how to enter below, and don't forget to use the Rafflecopter Widget so I can keep track of your entries! Sweepstakes will start Tuesday, January 14, 2014 and ends Wednesday, January 22, 2014 at 12 a.m. Winners will be randomly selected. Use the Rafflecopter widget below to enter, and check back next Wednesday, 1/22/2014 to find out if you are one of the lucky winners. Good luck! Hi, I came across your site by Google searching a Royal Blue blazer... I hope I win this contest! Glad you found me :) Thanks for reading and entering the giveaway! Happy to follow you on Pinterest! Great style, chica!